Tim presented the case for using authentic and compelling stories to connect with your audience, and to develop brand community and culture. Everything in Tim’s talk about storytelling rang true. One of my own favorite campaigns, Burton-Ching, was created with exactly this in mind. The company, though new, had a compelling story based on founder and designer Sen Ching. We recognized Sen’s story was the fastest way towards building a powerful brand. 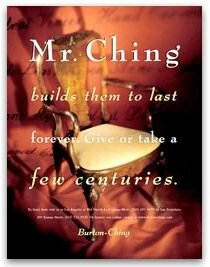 Mr. Ching had quite a story. Tim related some other personalities upon whom brands have been built: Steve Jobs and Apple, Enzo Ferrarri, Yves Saint Laurent, Bill Bowerman and Nike. At Nike, Tim says, the designers to this day say that Bill Bowerman is looking over their shoulders. Stories are potent cognitive seeds that plant themselves and grow in your memory, even when you’ve forgotten some of the details. If you recall an interesting story about someone you meet, you’re more likely to remember him than someone with no story. This applies to companies as well as people. After Tim’s presentation, I’m reminded of how powerful and important storytelling can be to my clients. Over the years, there was See’s Candies, Piedmont Airlines (a great regional story in the Southeast), Nike and Bianchi Bicycles. Even Kabira Technologies. (See the promo.) I wonder what true, authentic and compelling stories we can tell for other start-ups and technology companies that will give them an edge over their un-storied competitors. What about you? What’s your story? Your marketing message: Does it connect? This entry was posted in Communication strategy and tagged ad agencies, advertising, advertising agencies, Barrett J. Rossie, Barrett Rossie, brand, branding, Burton-Ching, community, culture, Girvin, marketing, Stories, storytelling by Barrett Rossie. Bookmark the permalink. What I do wonder about — simple, the enraptured myth in story binding; it’s really such a fabulously elegant solution; that stories are inherently reaching into the heart of memory, the very soul of our early, even psychic unconsciousness, that ultimately formed the basis of where we are going — as people, as listeners, as experiencers. Story reaches to the center of imagining. And sometimes people can relate.